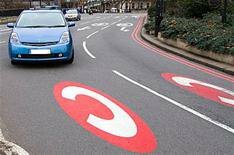 Big shake up of London Congestion Charge | What Car? A massive shake up of London's congestion charge has been put forward by London Mayor Boris Johnson, with plans to offer 100% exemption to the cleanest petrol and diesel cars and take it away from hybrids that emit more than 100g/km of CO2. Any car that emits less than 100g/km of CO2, and meets the other Euro V emissions standards will be exempt under the green vehicle discount (GVD) proposed today, a 'technology neutral' move suggested by What Car? and Volvo to Boris Johnson after he presented our Green Car of the Year award to the diesel-powered S40 DRIVe at City Hall last summer. Although the S40 DRIVe would not qualify for the proposed 100% green vehicle discount (GVD), as it emits 104g/km, the 99g/km C30 DRIVe would along with a string of other models like the recently launched Skoda Fabia Greenline. At the same time, no Lexus would qualify after December 24, 2010, although any qualifying car registered before this date would get the existing 100% alternative fuel discount (AFD) until December 24, 2010. Consultation documents released by Transport for London say: 'The greener technology in conventional vehicles has now overtaken many of those that use alternative fuels. 'Some vehicles eligible for the AFD perform less well environmentally than newer greener vehicles that don't qualify for the discount. A spokesman for Volvo said: 'As the instigator of this campaign we are absolutely delighted that the mayor has taken our view that any exemption should not be technology based but purely based around CO2. That then leaves manufacturers free to decide on the best way to achieve lower emissions. A spokesman for Toyota and Lexus said: 'Overall, it's quite good for us. We have a few models that fit under that limit, but Lexus does miss out. 'Hybrid has been important for Lexus as a brand. We needed to give people a good reason to come and try us and, hopefully, once we got them on board and they discovered they liked the car, the dealer and the service, they'll stick with us. 'Nobody was eyeing a 45,000 4x4 simply because of the 8 a day saving, and there are other incentives, such as company car tax, that Lexus still gets. 'There's a case that the AFD should be for three years - we'll submit some views. They may have a good reason for saying two and if that's the case, that's fine. 'Overall it's a good target and lots of manufacturers have cars that can get under that and we're well placed with plenty of models'. Under today's proposals, the westward extension of the zone would be scrapped, effectively halving its size, and the charge will increase from 8 to 10 (or 12 if you pay the day after). A 10 registration of any car is also proposed in a bid to make the charge easier to pay, and this will reduce the daily cost by 1 to 9.